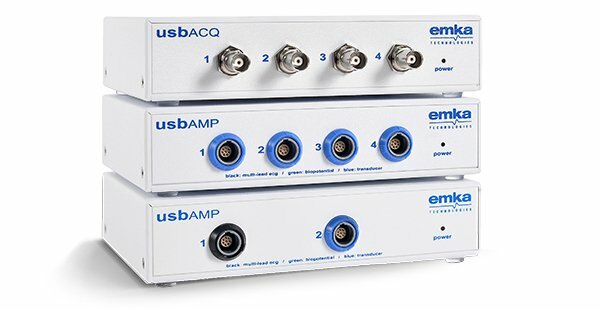 usbACQ, designed to acquire amplified analog signals. 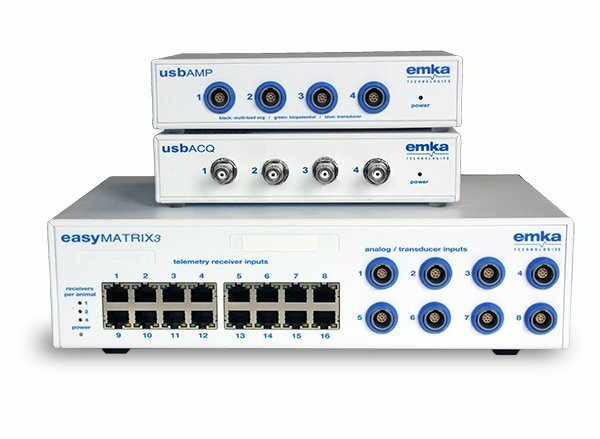 easyMATRIX3, used to read signal from telemetry implants (emka easyTEL and DSI implants, including recent HD models*) and any type of non-telemetry signals. The usbACQ device is used to interface between the transducer and the acquisition computer. It acts as an analog-to-digital converter. Biopotential electrodes (multi-lead or single lead ECG, EEG, EMG) and strain gauge transducers (force, pressure…) need to be amplified before digitization. In this case, the usbAMP device is used for direct USB link to computer running emka TECHNOLOGIES’ iox2 acquisition software. For rodents equipped with easyTEL implants or for subjects equipped with DSI implants*, the conversion is done through the easyMATRIX3 device, placed between the receiver and the computer. 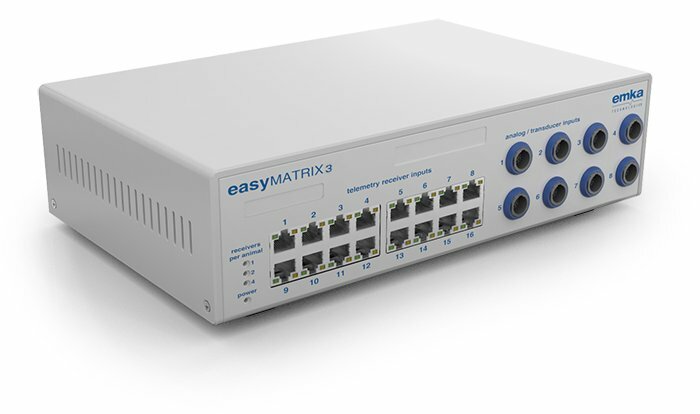 easyMATRIX3 simply connects to your existing telemetry receivers and to your computer through Ethernet. Therefore, an add-on A/D acquisition card is not required. 8 analog signals: biopotential electrodes (ECG, EEG, EMG) amplified by easyMATRIX3, analog signal already amplified, strain gauge transducers powered and amplified by easyMATRIX3. As it contains its own ambient pressure transducer, no need of an external ambient pressure reference monitor. As it records fully calibrated data from DSI implant with iox2 software, OpenART is not required either. A perfect synchronization between telemetry implants and analog signals allows combining, for instance, pleural pressure from implant and respiratory flow from head-out plethysmography for precise resistance & compliance measurement. NOTE: For large animals equipped with non-invasive emkaPACK4G telemetry or implanted easyTEL+ and for rodents equipped with rodentPACK, the signal is already digitized by the transmitter. Therefore, when received by the telemetry receiver, it can be directly sent to the acquisition computer, via Ethernet.